Ships and boats were the means by which the early explorers of Antarctica reached the continent and often over-wintered. They were very much the focus of Antarctic expeditions which were often named after the ship that took the men, their provisions and their equipment to Antarctica. Many landmarks in Antarctica are named after these vessels. 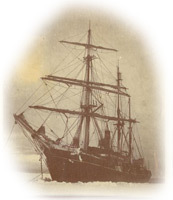 In the earliest days of Antarctic exploration, the vessels were sailing ships, they rarely entered pack ice as the ships means of propulsion was essentially the same as that of the ice itself, so unless the ice dispersed, great difficulty could be had in extracting the ship. Later on, with the advent of the screw propeller, ships became more able to enter, maneuver and make progress in pack ice. In particular they could break through ice by reversing a short distance and then going forwards again to ram it, repeating several times if required to break through. The first ships able to do this were steam powered and this progress kind of through ice was very heavy on coal. As Antarctica is so far away from any port and supplies, for many years Antarctic vessels were hybrids of steam power and wind. Wind was used wherever possible to conserve the coal stocks for later on in the voyage. 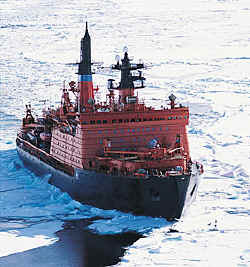 Strong hull, to minimize damage from floating ice, to avoid being crushed by sea ice and to be able to push its way through the ice. 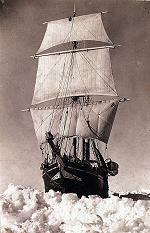 Rounded hull to allow the ship to ride upwards if pushed from the sides by wind-blown pack ice. The innocent sounding event of being "nipped" by the ice could easily end up crushing the ship and sinking it if it wasn't able to escape the grip. Re-inforced bows to withstand hitting against floating pack ice. Ideally re-inforced by massive structural strength and then clad in iron. Retractable propeller and rudder to avoid ice damage. Skewed bows so that when hitting pack ice the ship would ride up and over the ice breaking it with its own weight. Powerful engines economical with fuel for working in heavy ice. Well insulated on the inside to retain heat and not allow moisture to drip inwards from frozen ice and snow on the outside. Plenty of stowage space for scientific cargo and provisions for at least a year longer than the intended voyage - in case the ship was iced in. A good supply of ice anchors, long (14ft) ice saws and maybe dynamite to break a passage through winter ice to open water in the spring. Entertainments on board to pass the long dark winter months. Some comparative statistics for polar vessels over almost 200 years arranged by date of launching. Where "original strengthening" is marked for the hull, it refers to the fact that the hull design was stronger than the normal for a ship of the time. Note that until 1892, all ships had been built for some other purpose and only used in the polar regions as a consequence of their stronger than usual design features making them suitable for work around ice.